The Yazidi celebrations for New Year were covered by the Daily Advertiser (see article and photos below). 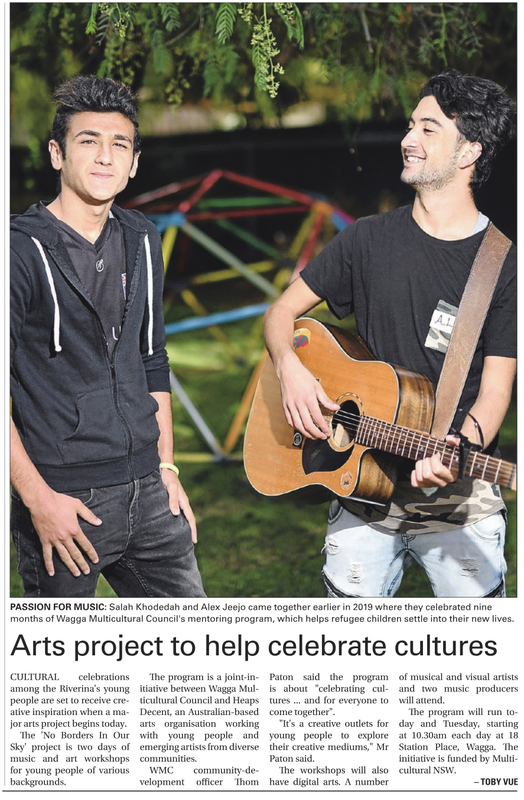 ASSION FOR MUSIC: Maryam Sulaiman, 17, and Tuba Gundor, 16, earlier in 2019 where they celebrated nine months of Wagga Multicultural Council's mentoring program. Cultural celebrations among the Riverina's young people are set to receive creative inspiration when a major arts project begins tomorrow. The 'No Borders In Our Sky' project is two days of music and art workshops for young people of various backgrounds. The program is a joint-initiative between Wagga Multicultural Council and Heaps Decent, an Australian-based arts organisation working with young people and emerging artists from diverse communities. The organisation provides a means by which young people may tell their stories in their own ways. WMC community-development officer Thom Paton said the program is about "celebrating cultures ... and for everyone to come together". "Basically, it's a monthly program where Heaps Decent will come to Wagga to facilitate a range of different arts workshops," Mr Paton said. "It's a creative outlets for young people to explore their creative mediums — whether that be song writing or music." The workshops will also have digital arts, including virtual- and augmented-reality technologies. While WMC and Heaps Decent have been working together for about eight years now, this is the first time this kind of project has been established. A number of musical and visual artists, along with two music producers, will attend, bringing a portable recording studio with them. The program will run on Monday and Tuesday, starting at 10.30am each day at 18 Station Place, Wagga.The initiative is funded through Multicultural NSW. A dress made from pineapple fibre might seem unusual to some, but for Wagga Filipinos, it is the material of their national dress - a fashion statement they are proud to make. Over the coming weeks, The Daily Advertiser will be highlighting fashions from cultures that are thriving in Wagga with women leading the way forward. Annabelle Borja moved to Australia looking for a better life for her family and arrived in Wagga in 2015. Annabelle Borja moved to Australia looking for a better life for her family and arrived in Wagga in 2015. "I am a permanent resident and I just lodged for citizenship," she said. Annabelle Borja moved to Australia looking for a better life for her family and arrived in Wagga in 2015. "I am a permanent resident and I just lodged for citizenship," she said. Mrs Borja said she is proud of her Filipino heritage and enjoys the chance to wear the national dress known as the baro't saya. "Baro't means the top and saya means the skirt," she said. "This is inspired the outfit of Maria Clara one of the female heroines in our national heroes book entitled Noli me Tangere, which means Touch Me Notthat was written by Dr Jose P Rizal. "Maria is a perfect example of a Maria Clara who is very conservative, very refined and very principled who fought for her rights as a person." Mrs Borja said she is proud of her Filipino heritage and enjoys the chance to wear the national dress known as the baro't saya. "Baro't means the top and saya means the skirt," she said. "This is inspired the outfit of Maria Clara one of the female heroines in our national heroes book entitled Noli me Tangere, which means Touch Me Notthat was written by Dr Jose P Rizal. "Maria is a perfect example of a Maria Clara who is very conservative, very refined and very principled who fought for her rights as a person. "Mrs Borja said the baro't saya was typically worn by the lower class as an everyday outfit. "Now in modern times, we wear it on Independence Day every June 12 and there this is this one week where we celebrate our language every third week of August as well as weddings, functions and political events," she said. "It used to be the daily wear, especially for those in rural areas until there were fusions and modifications. "The elite class then started to wear it as well and it's not worn a lot in modern times, but you see modified versions such as in Miss Universe Competitions." Mrs Borja said the baro't saya is made of pineapple fibre, known as piña, which falls softly when worn and is a "more sophisticated" look. "There are also pearls embedded because the pearl is our national gem and that's why I have paired this necklace with the dress," she said. "The fan is a part of the costume as well and it can be any colour, and often reds or blues are chosen. "Piña is not readily available in Australia so normally we export it. "Mrs Borja said she considers Australia her home and while her children have been raised here, she still wants them to be proud of their heritage. "It's important to go back to your roots," she said. "We still have the blood of The Philippines and by wearing our national dress, it is one way of giving back and knowing who we are. It's also a way to show our kids and teach them our heritage, culture and past." DOUBLE: Nazar Yousif scored two goals for Wagga United against Cootamundra on Saturday. Wagga United kicked off their Pascoe Cup campaign with a 6-0 thrashing of Cootamundra on Saturday night. Wagga United made light work of the Strikers in a dominant display under lights at Rawlings Park. The scoreline finished at 6-0 and it could have been more as Wagga United suggested they will be a serious player in this year's title race. Nazar Yousif scored a double for United, while Max Lysaght, Tyler Allen, Lincoln Weir and Adrian Merrigan also got on the scoreboard. Wagga United coach Travis Weir was happy to start the season with a big win. "It was quite dominant," Weir said. "It probably could have been more...but it was the first time we've played together and we've still got lots to work on." Cam Farey impressed for Wagga United in his first game back in years, while Adrian Weir was another to start the year strongly. In a surprise round one result, Leeton United defeated Tolland 2-1 at Leeton. Adam Raso scored two goals for Leeton, while keeper Jarrod Sillis pulled off an important penalty save. 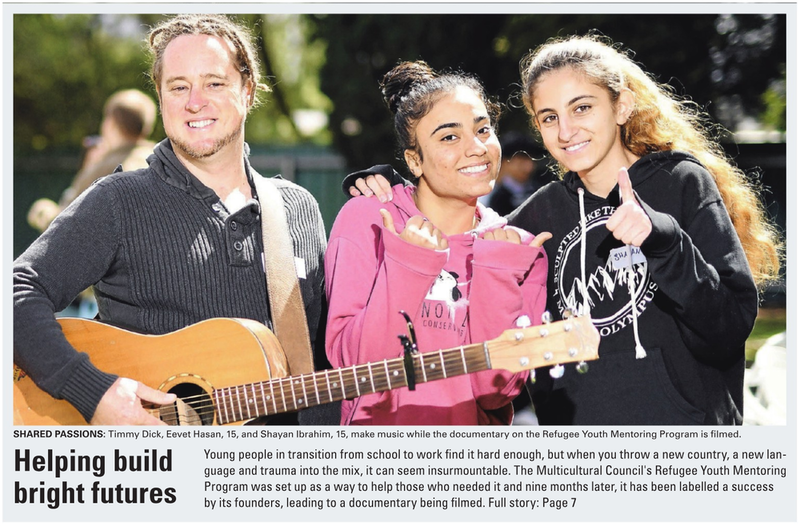 Front page story about our Refugee Youth Peer Mentoring Program, following our barbecue event and mentee-led film project! We are looking for more mentors, so please get in touch if you are interested. This story really tugs at our heartstrings! At a little garden in Wagga, immigrants have been sowing the seeds for diversity, planting fruit and vegetables from their motherlands. 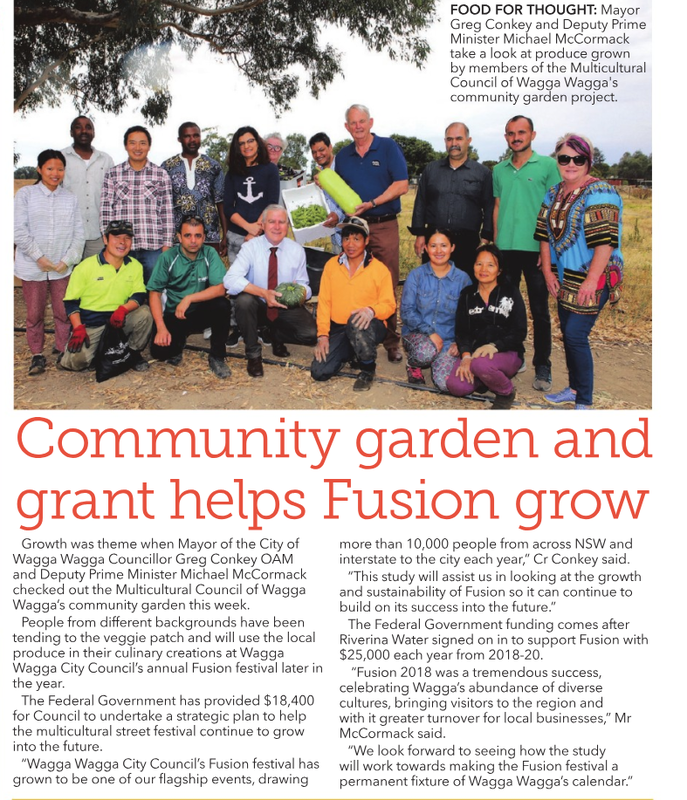 From that paddock, to a party, the produce will be showcased at the upcoming Fusion Festival. Yazidi women, Diyana Gundor, was persecuted in her homeland of Iraq..eventually finding safety in Australia. 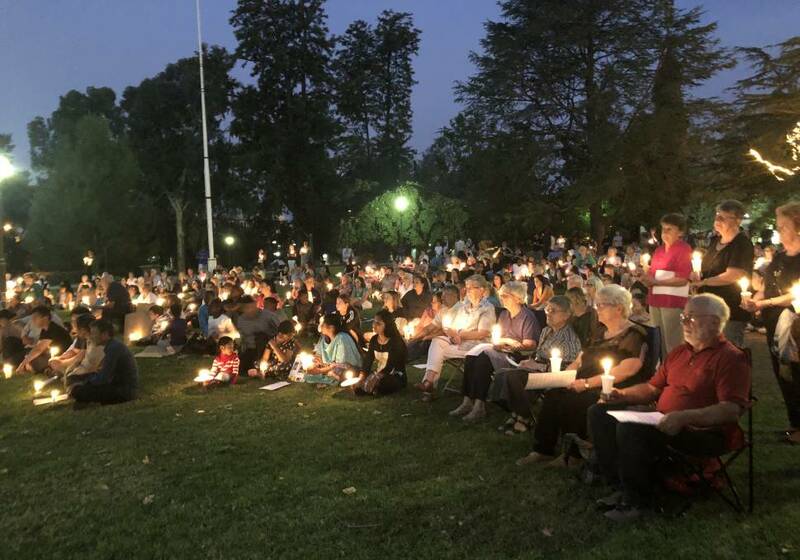 Hundreds of candles have been lit and flowers laid in Wagga's Victory Memorial Gardens in the wake of the tragic events in Christchurch. In a display of solidarity, people from all walks of life have come together to show the city's Muslim community support and love. More than 400 people gathered in the Victory Memorial Garden's to mourn those lost in the Christchurch terrorist attack and show support for Wagga's own Muslim community. On Friday, two gunmen opened fire at two central Christchurch mosques, Al Noor and Linwood, killing more than 40 people. Muslims and non-Muslims alike gathered on Sunday in Wagga to honour the lives lost and show acts of terrorism have no place in any community. Dr Ata Ur Rehman said he had been sent the video of the massacre and could not believe what he was seeing. "If this attack proves anything, it is that terrorism has no religion," he said. "It makes me even more distressed to realise the person who committed this act was an Australian. "Despite the anti-Muslim sentiments being spread on social media, we will continue to stand as proud Australians." Dr Rehman said he had been overwhelmed by the support shown by people from all works of life. "A special thanks to the Wagga Police for making sure our places of worship are safe," he said. Dr Rehman said an event such as the tragedy in Christchurch shows the dangers of social media. "We need to work together to remove extreme hate, whether right-wing or ISIS, from social media," he said. Azizeh Abbasi said learning about the horrific deaths of her fellow Muslims in New Zealand was heartbreaking. "The important thing is to have peace and in my opinion, it doesn't matter what religion you are," she said. "Islamophobia was the centre of the attack but in reality, we think everyone should be treated the same. "It is so beautiful to see so many people who are gathering in support." Ms Abbasi has been living in Wagga for 18 months after fleeing from Afghanistan to Iran and reminds the community, this is not the first time Muslims have been targeted. "In my country, there is a war every day and many Muslim people are being killed by the Taliban and ISIS," she said. Mariam Rehman, a Wagga Muslim, said she was fearful and had not slept properly since news of the massacre emerged. "When I saw the turnout, my emotions changed because support is not only holding a candle, it means they're saying 'we are your fellow Australians'," she said. "It hits so close to home when you find out the attacker was Australian and it's your neighbours. "Before this, I would ignore racism but it is our role to stand up against violence and it shouldn't take more than 40 lives for us to realise what discrimination is." 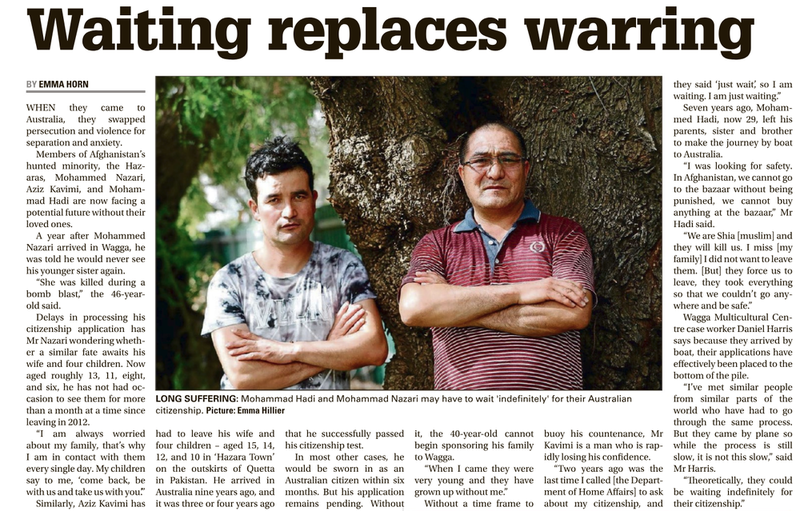 Mostafa Eslampanah recently escaped Afghanistan and has been living in Wagga for two months. "Hearing about what happened, it is upsetting and I hope to never see something like this happen again," he said. "One of the best things about Wagga is seeing the people come together now." Saira Ali said it was heartbreaking to learn of the lives lost, but the candlelight vigil provided emotional support. "It is a dark time, but it is good to see so many people here," she said. "To my fellow Muslims, we are with you and we pray for you and for all of humanity, not only Muslims, to be protected." Kylie Anderson attended the vigil along with her children in a show of support for their friends. "We have Muslim friends in our community and we are to support them and New Zealand and to show respect," she said. "It is so important to show that we are all one community. "As the kids wrote on their signs, everyone one is equal and we need more love instead of hate." Riverina Police District Inspector Adrian Telfer said they attended the vigil and were working closely with the Muslim community to ensure they felt safe. Belinda Crain, CEO of the Multicultural Community, said it was beautiful to see so many people attend the candlelight vigil. Women from around the world have come together in Wagga to celebrate International Women's Day. There were women from the Yazhidi community, from Burundi, Zimbabwe, South Sudan, Afghanistan and Nepal along with many others who call this city home at an event organised by the Wagga Women's Health Centre and the Wagga Multi-Cultural Council. 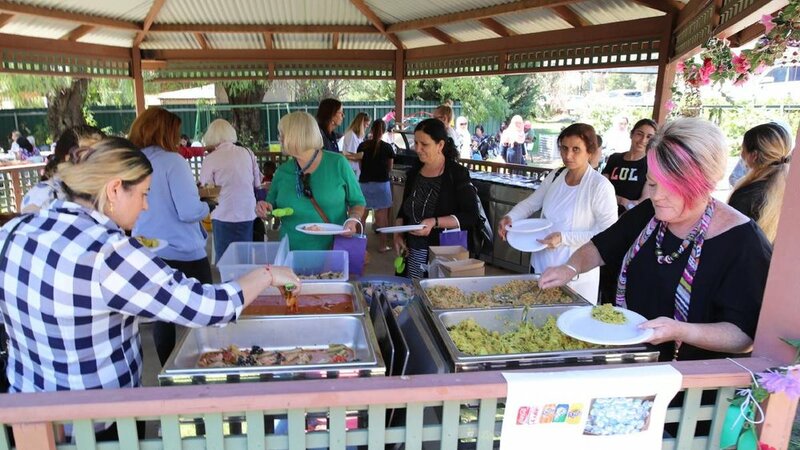 The day-long event included art, craft, music, interactive activities, lucky door prizes, children's activities and a massive, community-wide shared lunch of multi-cultural cuisine, including a sausage sizzle. "The theme for International Women’s Day 2019 is Balance for Better," Julie Mecham from the Wagga Women's Health Centre. "This theme is a call to action to strive for gender balance throughout the world, to support women's advancement and to openly celebrate our achievements, not only on International Women’s Day, but all throughout the year." For Lucy Zatang, who is originally from Myanmar, International Women's Day is a chance to reflect. Ms Zatang spent seven years in Malaysia as a refugee - and her husband nearer 10 years - before being able to resettle in Australia. The couple, who have four young children, came immediately to Wagga after arriving in Australia. Ms Zatang said one of the joys for her was the range of activities open to her two sons and two daughters here. "We are free and happy and healthy. Wagga is clean and quiet. There are beautiful people here, who smile at young on the street," she said. "There are lots of different activities and places to go." International Women's Day has been celebrated for more than a century. The first gathering in central Europe in 1911 was supported by more than a million people. Wagga's Yazidi community are standing up and readying for a peaceful protest to cry out against the horrific execution of 50 women in Syria. Rashed Shani Baqi said soldiers discovered the bodies last week when they gained access to Baghuz, where ISIS is desperately clinging to their territory. "Women are captured as slaves and raped," he said. "Soldiers surrounded ISIS in a small area and they were told if any ISIS were killed then the Yazidi slaves would be murdered. "Last week, 50 women were found executed with their heads cut off." Haji Gundor said horrific events continue to happen to the Yazidi community and the young children left in Iraq and Syria are being brought up as child soldiers for ISIS with no knowledge of their culture. "It is really hard to see this," he said. "Not only do we feel the pain of who losing who has already been killed, but now it is even more painful. "One boy, interviewed by an overseas journalist, remembers nothing after his parents were killed and he was trained to kill." Mr Shani Baqi and Mr Gundor both said they couldn't understand why no one was reaching out to help the Yazidi. "We want to the government to try and save the women and children who are still in captivity," Mr Shani Baqi said. "After five years of war, everyone knows the Yazidi are in captivity and are being sold, used and killed." This is not the first time the Yazidi community have been targeted by ISIS. Mr Gundor said ISIS attacked Shingal, Iraq murdering more than 5000 people on August 3, 2014, and this is only one of 74 genocides. "We are a peaceful people and our women, men and children are being killed," he said. "If something is not done, this religion is going to end." Mr Shani Baqi and Mr Gundor are pleading for international aid for those left behind. "If the world does not move, then I think we will lose all of them," Mr Shani Baqi said. "There are thousands of stories of suffering, but we are choosing to focus on this one for now. 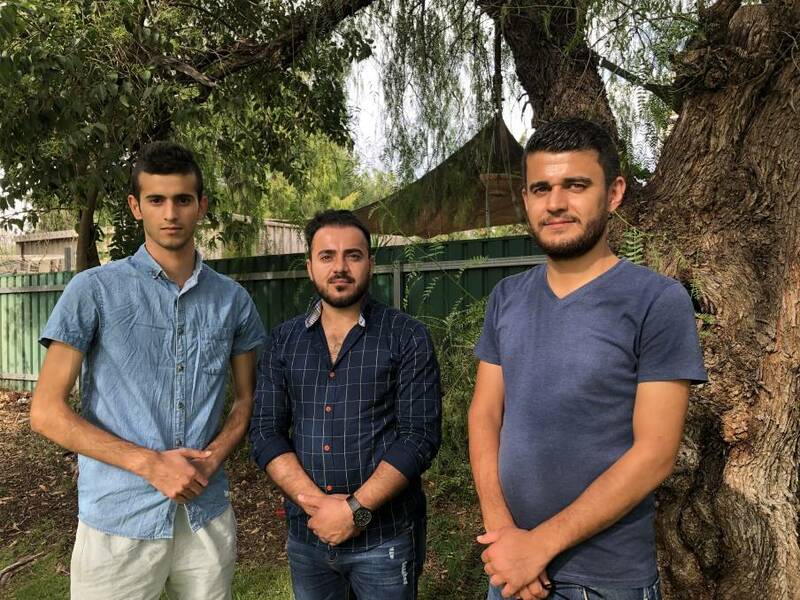 "CEO of the Multicultural Council, Belinda Crain, said the council was supporting the Yazidi community and encouraged Wagga's residents to come down and show their support. Yazidi Celebration - Hundreds of Yazidi refugees gathered in Wagga today to celebrate their new year.